* Explains how the 2008 financial meltdown came about and how to revitalize global and domestic economies* Shows how capitalist economies developed and why the state matters in their functioningFree market purists claim that the state is an inefficient institution that does little for society beyond providing stability and protection. The activities related to distributing resources and economic growth, they say, are better left to the invisible hand of the marketplace. These notions now seem tragically misguided in the wake of the 2008 market collapse and bailout. Mark Martinez describes how the flawed myth of the "invisible hand" distorted our understanding of how modern capitalist markets developed and actually work. Martinez draws from history to illustrate that political processes and the state are not only instrumental in making capitalist markets work but that there would be no capitalist markets or wealth creation without state intervention. He brings his story up to the present day to show how the seeds of an unprecedented government intervention in the financial markets were sown in past actions. 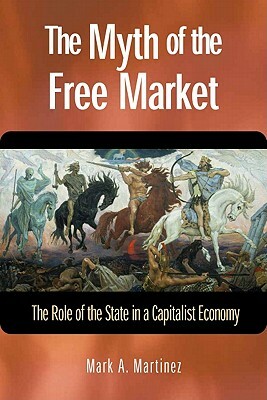 "The Myth of the Free Market" is a fascinating and accessible introduction to comparative economic systems as well as an incisive refutation of the standard mantras of neoclassical free market economic theory.